Amazon UK has now stopped taking pre-orders for the Wii U Premium Pack and appears that they have now sold out of their initial allocation from Nintendo. John Lewis, Zavvi and Very.co.uk have also recently stopped taking online pre-orders. It remains to be seen whether we witness similar stock shortages like the original Wii console during Christmases 2006 and 2007, however with over 5 weeks until launch and major online retailers starting to halt pre-orders it's looking likely that stock shortages are a possibility again. 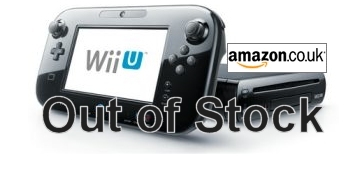 Most online retailers in the USA stopped taking pre-orders just weeks after the Wii U announcement with GameStop, Best Buy, Target, Kmart, Toys R Us and Wal-Mart all halting orders. EBay prices have also gone crazy. Back in the UK Nintendo have shown their first television advertisement for the Wii U console. It was aired during a commercial break on Channel 4's popular "Homeland" program on Sunday night (21st Oct) at around 9.20pm. The ad lasted one minute and featured five different ways to play the Wii U. In our opinion it was a bit cringeable at times but tried it's best to get across the new features of the console.